There is a whole new vocabulary for me when it comes to soul food. Maybe because I don't live in the South and I'm not an African American, but soul food is a category all its own. So what is it? Soul food is traditional African-American cuisine of the southern United States. 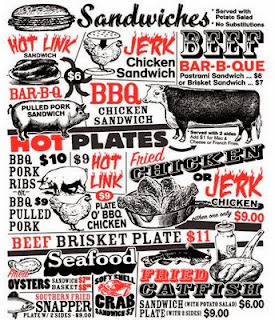 Considered an ethnic cuisine, many elements of soul food are basic in southern US cooking also. I never realized it but I have been eating elements of soul food my whole life, like macaroni and cheese, and fried chicken. The recipes that African Americans had been cooking for generations, the staples of soul food cooking, include beans, greens (green, leafy vegetables), cornmeal (used in cornbread and as a coating for fried fish), and pork. As I wrote in the beginning, most soul food dishes are a mystery to me so I think I should expand my scope and go to a soul food restaurant in my city (Milwaukee). I read a review of Mr. Perkins' Family Restaurant where one diner describes it as "soul food heaven". Sounds great.